One of the things I like about the variety of interests I have regarding hobbies/entertainment (e.g., comic books, video games, tv shows, movies, music) is pulling out "common threads" that link these various hobbies and forms of entertainment together. Furthermore, I'm interested in which types of stories (as told through various forms of media) are popular at different time periods, and what this media seems to be "saying" as a whole about the human condition. For instance, I've noticed that recently, stories that have to do with the essence of being human and the purpose of life seem to be real popular nowadays (e.g., movies like District 9 and Surrogates; television shows like FlashForward, the Sanctuary and V; comic book series' such as the Blackest Night). I plan on addressing some of these in future posts. This post focuses on a particular comic book character, and the current season of one of the best shows on television, Heroes. "How often must the scoundrel prove himself a hero, before he believes it himself?" Since I can remember, my favorite member of the X-Men has been Gambit(I've recently added Storm, Iceman and Nightcrawler to that list). As I look back on his life before, during, and after being an X-Man, I've found it interesting that while he's not necessarily your "gung-ho" hero type, he always seems to aim towards making the "hero-type" decision regardless of the situation he finds himself. And over the years, he's found himself in some crazy situations! Here's a quick run down of some of those situations, and the choices he made in those situations. Situation #1: While a teen or young adult, Gambit's father introduced him to Mr. Sinister (formerly known as Nathaniel Essex). To allow Gambit to show off his skills (Gambit and his family were part of the Thieves' guilt, whose rivals were the Assassins' guild), Mr. Sinister gave Gambit his first assignment: to break into the Weapon X facility and retrieve Essex's research diary (he did not tell Gambit that he was Essex). Once inside the facility, he saw all of the inhumane experiments that were taking place. Once he found the diary he burned it, on the grounds that no human should be treated like these patients were being treating. Upon returning to Mr. Sinister, he told him that the mission was unsuccessful because he was unable to retreive the diary. Situation #2: When the manifestation of his power resulted in the death of his former wife's (actual wife at the time) brother, he sought out the help of a mutant geneticist (Mr. Sinister) to "tone down" his powers. As a result, this Mr. Sinister asked to be apart of and recruit members for his group, known as the Mauraders. Although unaware, Gambit was actually recruiting a team whose first mission was to slaughter innocent mutants (Morlocks) living in then sewers. Once he found out, he fought the Marauders and tried to prevent the massacre, and was almost killed in the process. Although unable to prevent the massacre, he was able to save a little girl, Marrow, who would grow up and be a prominent Morlock leader. Situation #3: Trying to capitalize off of the desperation of the remaining mutants after Scarlett Witch (Magneto's daughter) wiped out over 90% of the mutant population, Apocalypse presented himself as the "mutant savior," ensuring the humans' survival and future triumph. In an interesting move, Gambit volunteers to become one of Apocalypse's horseman, meaning that his powers would be augmented and he would be more powerful. Although he may have agreed with some aspects of Apocalypse's perspective, Gambit warned apocalypse that if he is really trying to harm mutants as opposed to help them, then he would commit himself to stopping apocalypse. After Apocalypse was defeated and Gambit realized the error of his ways, he sought the help of Mr. Sinister to "reverse" what apocalypse had done to him. (1) When Gambit and the Mauraders try to retrieve Destiny's diaries (Destiny was a mutant could see parts of the future, and her diaries were believed to contain vital information for the future of mutants) from Iceman and Cannonball, Gambit "accidentally" destroyed the diaries before the Mauraders could retrieve them. (2) When Gambit and Sunfire were ordered by Mr. Sinister to "take out" Cable so he would ruin Sinister's plan for the coming messiah baby, Gambit mentioned a phrase to him during their battle in the form of a hint as to what's to come. Perplexed by the phrase, and realizing that Gambit may have been trying to tip him off to something, Cable researched the phrase on the computer, eventually enabling him to be the first to gain possession of the messiah baby once she was born. (3) After the X-Men got word of the messiah baby's birth and confronted the Mauraders hoping to find her, Gambit did not join the Mauraders during the fight. 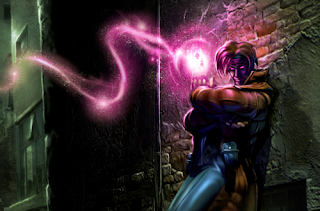 In fact, Gambit went to hide, so he would not have to fight the X-Men. Situation #5: The result of multiple groups fighting each other to the death in order to gain access to the messiah baby was Professor Xavier (founder of the X-Men) being shot in the head. After surviving and going into hiding, Gambit came to his aid to protect him. Interestingly enough, Professor Xavier started his own road to redemption, making amends with mutants he felt that he had wrong in the past. Gambit traveled much of this road alongside him. As these situations illustrate, Gambit always seems to do things to "make up" for some of the choices he's made. 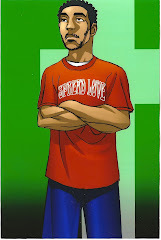 Furthermore, his directionality points towards being a hero, although at times he may not believe he is himself. This idea of redemption seems to be common to the human experience. We often have a need to "make up" for some of the wrong things we felt we've done. Either through changing for the better, performing good acts, or through encouraging others to make better choices than we've made. 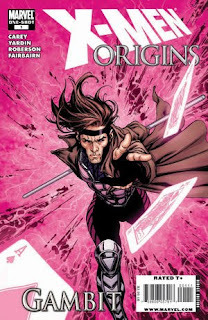 I guess it makes sense that the title of Gambit's origin story was "Random Acts of Redemption." Wassup fam, thanks for hitting up the blog and it's great to hear from you! 4 Years and Counting: God is Good!